To cook the chicken, in a large pan bring the water and salt to a boil over high heat. Add the chicken, and then reduce the heat and cook, partially covered, for 15 minutes; the water should simmer gently, not boil hard. Remove from heat and set aside for about 30 minutes. Remove the chicken from the cooking liquid and, as soon as it is cool enough to handle, cut it into bite-sized pieces about 1/2-inch across. You will have 6 - 7 cups chicken, more or less. Set aside. To make the dressing, in a large bowl whisk together the mayonnaise, curry powder, cumin, mustard, pepper, chutney. 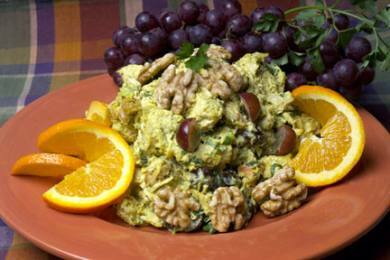 Add the grapes, parsley, green onion, walnuts and chicken pieces. Stir and toss with a large spoon to coat everything evenly with the dressing. Taste the salad, and add more curry powder, and salt to taste, if you wish. Place each serving of salad on a lettuce leaf and garnish with an orange slice or two. Nutritional information per serving: 495 calories, 31g protein, 16g carbohydrate, 2g fiber, 325mg sodium, 89mg cholesterol, 35g fat, 4g saturated fat.